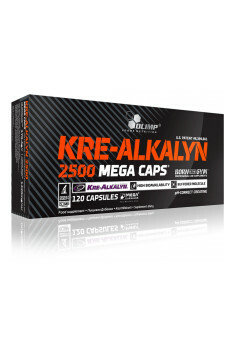 Olimp Kre-Alkalyn 2500 is a patented formula of the buffered creatine monohydrate Kre-Alkalyn®, encapsulated in unique Mega Caps® capsules. The used form of creatine is characterized by high bioavailability, thanks to which it effectively complements the creatine stores in skeletal muscles. Creatine is an ideal supplement for all physically active people that will help increase the body's exercise capacity and facilitate the process of building the muscle mass. Mega Caps® is a specially developed technology by Olimp, allowing to place more active ingredients in one capsule. This technology allows reducing the recommended portion, which positively affects the condition of the digestive tract. Creatine monohydrate is the most popular form of creatine, which shows strong ergogenic properties. It is a combination of creatine and water molecules, thanks to which it influences the hydration of cells and affects providing nutrients to them. Unfortunately, it is sensitive to changes in the pH level and is inactivated by the acidic environment in the stomach, which makes it unable to perform its function. Kre-Alkalyn® is an advanced formula of buffered creatine monohydrate combined with magnesium salts. It shows alkalizing properties and prevents the inactivation of creatine in the stomach. Thanks to this, creatine gains chemical stability, which allows the use of creatine for the production of high-energy compounds. Buffered creatine monohydrate, in contrary to other forms, does not require the additional intake of substances facilitating the transport of creatine or the use of a loading strategy, involving the intake of higher doses of creatine. After an intake creatine is transformed to phosphocreatine (PCr), which plays an important role in the energy production at the cellular level. By providing the phosphate group, PCr contributes to the reconstitution of adenosine triphosphate (ATP) - the basic energy carrier in the body. During the course of an oxidative phosphorylation, the phosphate group is attached to the adenosine diphosphate (ADP) to re-create ATP and allow the course of many biochemical processes in the body. As much as 95% of creatine stores are found in skeletal muscle, where it is used by the creatine kinase to recreate ATP from ADP. During short and intensive exertion, such as weight lifting, biathlon or Olympic triathlon, the body relies on an energy path that uses phosphocreatine as the main source of energy. The phosphate pathway allows only for a few seconds of work, because its stores are quickly depleted, however, taking creatine helps to regenerate ATP fast and maintain the ability to produce the strength and muscle power. Not only people who conduct the strength trainings will benefit from the creatine properties because it also increases the exercise capacity during a long-term physical activity. It has been shown that creatine raises the level of oxygen (VO2max), duration of exercise until exhaustion and muscular endurance. It also delays the feeling of tiredness and fatigue during training, helping to maintain high intensity or training volume. Creatine is associated with an increase in the activity of anabolic hormones such as insulin-like growth factor (IGF-1), growth hormone (GH), and testosterone. These hormones contribute to the increase in the rate of synthesis of new muscle proteins, the construction of qualitative muscle mass and maintenance of the lean body. Creatine reduces the degree of damage to muscle fibers during the physical exertion, which then appears as a delayed onset muscle soreness. It also promotes the resynthesis of muscle glycogen, which shortens the time of muscle recovery and allows to perform the next training unit. In addition, it reduces muscle catabolism and the level of myostatin which increases with age and inhibits the maintenance and development of muscle mass. In summary, Olimp Kre-Alkalyn 2500 is an advanced form of a buffered creatine monohydrate, characterized by high bioavailability. Its biochemical properties allow it to pass intactly through the digestive system and positively affect the exercise capacity. Creatine has strong ergogenic properties, conducive to maintaining strength and endurance of the body. It promotes the building of qualitative muscle mass and accelerates the post-training regeneration while preventing the muscle catabolism. Kre-Alkalyn 2500 Mega Caps 120 caps. Take 2 capsules in the morning on an empty stomach and 2 capsules before training. Take 2 capsules in the morning on an empty stomach. Most benefits from using creatine are visible when we combine it with a balanced diet and properly adjusted physical activity. It may be used in various sports disciplines, however, the largest effects are visible in case of repetitive efforts, characterized by high intensity and short duration. The most beneficial effects, in the form of increased stamina and ability to strength effort are derived in connection with high-protein diet. Microcrystalline cellulose - filling substance, magnesium salts of fatty acids - anti-caking agent, capsule (gelatin, E171 color). Synergistic stack of substances with powerful anabolic properties: ostarine, MK-677 and LGD-4033. Protein-carbohydrate cocktail powder with addition of creatine monohydrate and glutamine peptides. Myostatin inhibitor. It increases muscle growth, helps to increase strength and endurance.